NT barramundi fishing – sensational! The big barramundi came thick and fast at Easter, which coincided with huge tides and good floodplain run-off. Here’s just one fish, caught by Rob Cunningham near Shady Camp, fishing with champion angler Justin Jones of Obsession Fishing Safaris. Shady Camp fished well at the mouths of Tommycut and Sampan Creeks. 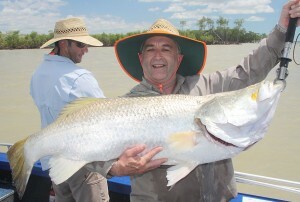 The Roper River region has produced the biggest fish, with at least three over 1.3m taken. The Daly River is the place to be now, with the greenwater running and good trolling expected. See all the latest reports here.